"... come days of unprecedented drought, when all the plants withered, while people and animals perished for lack of water. Then the sufferers turned to Demir Baba for help. And he reached whit his hand into the very rock and a spring of healing water gushed forth. 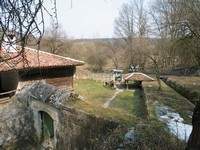 ..."
Another sanctuary of the underworld deities, water and health was founded in the deep shady valley at the foot of " Kamen Rid ", near the never failing spring in the very heart of the reservation about three centuries later (6th. century BC) and existed till the beginning of the new era. The rock with the sacrificial altar near the entrance to the inner court of Demir Baba Teke is preserved up to the present, and the grooves dug into it still retain the memory of water, vine and sacrificial blood that oozed down into a large clay vessel, dug into the base of the rock. The enormous rock fragments incorporated in the northern and southern walls of the turbe are remnants from the Getic sanctuary, dating back to the time of the sacrificial altar. And until this day visitors lie upon them in order to gain health and energy. 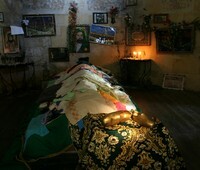 The tradition of the sacred place was carried on later by a Christian chapel. For at the end of 19th century, during their first archaeological survey of the region, the Shkorpil brothers described a big stone cross on the hill slope but, unfortunately, no traces of it have been found so far. 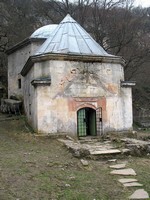 At the beginning of 17th century, a tomb (turbe) of the Alian saint Demir Baba Teke was built on the same spot. It is a monumental heptagonal vaulted building with an antechamber and entrance on the eastern side. The intertwining of Alian, Sunni and Christian traditions on a much more ancient basis is evident in the hitherto existing ritual practices in that place. The tying of bits of rags on tree branches, the ritual washing and lying down on the rocks for acquiring strength and other essentially magic acts have come down from those ancient times when the Great Goddess, mother of all that breathes, was worshipped and ritually and dressed on definite holidays. The custom of offering sacrifice in that place in acknowledgement of recovery or as a votive offering also shows traces of ancient traditions.